Bunaken beheimatet eine der schönsten und diversesten Unterwasserwelten dieser Erde, mit unzähligen Populationen an Fisch und Korallen aller Art. Meist beginnen die Riffe im flachen Wasser bevor sie mal steil, mal langsam auf zwischen 15 und 40m Wassertiefe fallen, manchmal sogar mehrere hundert Meter. So ergeben sich spektakuläre Formationen aus Gräben, Höhlen, Schluchten oder einfach lieblichen Wänden, die einfach nur zum Tauchen einladen. Bunaken bietet für jeden etwas, den erfahrenen Taucher und den Anfänger. Zwischen „macro“ und „Breitsicht“ sowie „muck“ und „blue water“ sind hier Korallen und Fische in allen Farben, Reptilien, Schwämme, Krusten- und Säugetiere zu bestaunen. Excellent variety of healthy soft and hard coral coverage right along these two dive sites, and is often referred to as the most colorful side of Bunaken. Fishes like: emperor fishes, parrotfish, jacks, dogtooth tunas, butterfly fishes, angelfishes, sea snakes, blue-spot stingrays, white-tip reef sharks and sometimes grey sharks make this side of the island home. Ideal for night dives. Easy access just 60 meters in front of the resort, our house-reef offers divers and snorkelers pristine coral gardens and too many tropical fish species to count in a single visit here. Divers and snorkelers frequently spot turtles and the occasional reef shark. Many colors and varieties of anemones with their guardian fish at this reef. This site is a steep slope with very good coral coverage in the shallows and deeper. As well as hard coral this site has a healthy variety of soft corals, sea fans, and barrel sponges. There is a nice mix of angelfish, butterfly fish, surgeon fish, anemone fish, and other colorful varieties. A large school of black snapper are always guarding the boat entrance to the village and divers are often surprised by visits from black tip reef sharks and large napoleons. This is also a great site for many turtles. Starts as vertical wall and becomes a steep coral covered slope with many hiding places for turtles of all sizes. Most commonly seen are green turtles that are sometimes so large German divers have referred to them as Volkswagon Beetles. Hawksbill and olive ridley turtles are also seen. Large schools of blue and yellow fusiliers frequent this site and look spectacular passing by when looking out in to the blue. Schools of mouth mackerel also love this site, as well as hundreds of species of other tropical fishes and occasional visits from some species of large tuna. Three species of turtles have been seen on a single dive here. These are two of the most popular sites made up of mainly vertical walls with canyons and many crevices and over-hangs. Here your chances are very good to see giant trevally, dogtooth tuna, black and midnight snapper, banner fish, unicorn fish, damselfish, pyramid butterfly fish in very large numbers, sea snakes, large emperor fish, groupers, lionfish and scorpion fish, napoleon wrasse, turtles, variety of moray eels, and sometimes white-tip reef sharks. The reef is filled with feather stars, gorgonians, black corals, giant sponges and ascidians. Near the point of Likuan I a large school of big-eye jacks and families of bump head parrotfish are often seen. Are jagged almost vertical walls and sandy slopes with coral out-crops rising from the slopes, which are quite near to the reef. Many varieties of healthy hard corals cover the reef of this site. Impressive large table corals, gorgonian fans, and branching corals are plentiful. White-tip and black-tip reef sharks, barracudas, turtles, fusiliers, hawk-fishes, groupers, unicorn fish, angelfish, sweetlips, mouth mackerel, and sometimes eagle rays. Ideal for night dives and flashlight fish are often spotted here. Is a combination of sheer walls and slopes with coral out-crops. This site is jagged topography with many large openings and crevices in the reef. 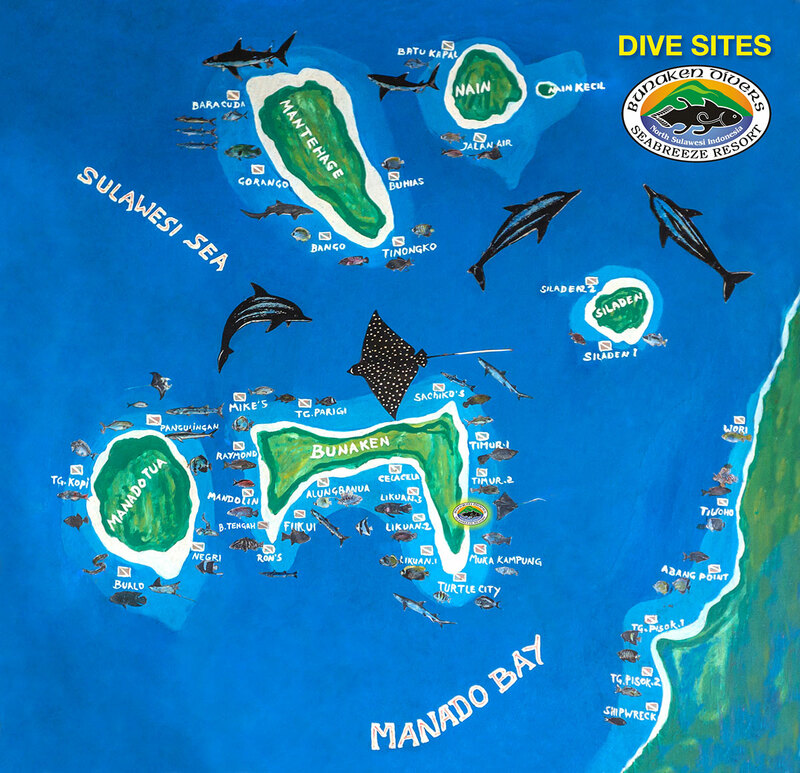 Out from the wall are 3 pinnacles in deeper water which attract black and white tip reef sharks and eagle rays. Along this site the soft and hard corals growth is good with many fishes like butterfly fishes, surgeonfish, parrotfish, fusiliers, wrasses, and also a myriad of color made up from the many varieties of basslets and anthias in the shallows. A nice reef top with many completely covered foliose and hard corals, also a very good topography with canyons and many small caves, overhangs, ledges, and crevices. Here there are frequent large schools of blue and yellow tail fusiliers, rabbit fish and snapper schools at the turn in the reef wall, and myriads of smaller reef fish like basslets, anthias, blennies, and Fishes like in Fukui Point. One of our nicest sites for night dives. This is one of the most famous sites of the park because it is generally the perfect site for first dives of courses or introductory dives. The reef top here starts at 3 meters with very colorful patch reef amongst white sand, and then slopes quite gently downwards. In some sections of the slope there are huge gardens of spectacular cabbage corals, and some of the biggest barrel sponges in the park. Well known for its rays, turtles, barracuda, jacks, sweet lips, triggerfish, black snapper, batfish, spadefish, and many species of wrasse, angelfish, butterfly fish, and anemone fish make it a site for everyone, but don’t be fooled by the easy nature of this site because Dugongs, Mola Mola, and even the odd whale shark is sometimes seen here. Starting as a sandy patch reef slope it levels out to a flat bottom area, and going out across the bottom leads to very large coral formations and at least three separate subsea type gully’s. Back at the slope approaching the point black tip reef sharks, giant trevally and a school of big-eye jacks are commonly seen, and after turning the point there is a relatively flat sandy area in 15 to 11 meters with two huge coral outcrops which attract good numbers of parrotfish, butterfly fish, scorpion fish, and grouper. This site has more blue tangs (Dory from Finding Nemo) than any other site in the park, and more napoleon wrasse than most other sites. This is generally the best site for a chance to spot Dugongs as well. Strong downward and spiraling currents are often present here, so important for the right planning of possible day and time to dive this site. In the deeper parts there are small caves sheltering many fish, and a section of this dive we call “Gorgonian Wall”. The very beautiful reef top has plenty of species of hard and soft corals. Fishes like banner fishes, large angelfishes, fusiliers, damselfishes, butterfly fishes, big sweet lips, groupers, napoleon wrasse, turtles, sea snakes and barracudas. This can be one of the best drift dives in the park. With sometimes a strong current, the reef offers yellow tail and blue fusiliers in incredible numbers, and many species of parrotfish, batfish, jacks, and wrasse, with white tip and black tip reef sharks often seen. Along a reasonably large section of this dive there’s an area of branching corals in the shallows which has been completely colonized by various species of squirrelfish. This site can be a nice drift along the reef. This very colorful and intensely coral covered steep slope has excellent numbers of hard and soft corals with hundreds of whip corals jutting out from the slope and is home for many lobsters, nudibranchs, angelfishes, butterfly fishes, big emperors, groupers, tunas, red snappers, stingrays. Sometimes the current at this site runs comfortably horizontal, but at sections can change to vertical. Catch the right time and tide here and exciting drift dives are possible. Here are many massive boulder corals, black corals, sponges, large gorgonians and ascidians. Angelfishes, butterfly fishes, snappers, filefishes, groupers, and fusiliers are plentiful here, and large jacks, eagle rays, and white-tip reef sharks are often seen, with occasional visits by grey reef sharks. This is a site with a combination of very jagged reef with big separations in the walls and slopes forming inlets to the shore in some places. Reasonable numbers of angelfish, blue fusiliers, butterfly fish, banner fish, and small schools of black snapper. Some of the more rare nudibranchs are found here on occasions. Big fishes prowl this steep slope including large tunas, turtles, banner fishes, damselfishes, angelfishes, sweet lips, big-eye jacks, great barracuda, napoleons, and incredible numbers of red tooth triggerfish have colonized this site. Near the point at Sachiko black tip reef sharks are often seen. Wonderful reef top and slopes with a huge variety of colorful hard and soft corals, feather stars, gorgonians, giant clams are dense here. There are many different species of anemone fishes, moray eels, butterfly fishes, angelfishes, groupers, mackerel, basslets, anthias, and stingrays and turtles are regularly spotted. This site is not as colorful and does not have the variety that Siladen I has, but is an interesting site to look for the harder to spot species, and has a lovely soft coral garden of mainly one species of coral. Sometimes divers are surprised here by big pelagic fish like dogtooth tuna, Spanish mackerel, and bluefin tuna passing by in the blue. Here the many crevices and large cracks in the reef form large detached sections of reef, and some small caverns. Very good soft corals here with good variety of angelfish, butterfly fish, parrotfish, and sea snakes and turtles are often seen. In front of the church a steep wall with vertical canyons, caves and caverns dominate the landscape here. Soft and hard coral growth is good and there is a particularly nice cave at 20 meters. Normally seen here are angelfish, butterfly fish, parrotfish, batfish, banner fish, and sometimes bigger pelagic fish passing by. Is a rocky wall with little coral coverage and with moderate numbers of sweetlips, emperor, parrotfish, surgeonfish, rabbit fish, and snapper, but can also be a surprise dive with sightings of grey sharks, white tip reef sharks, black fin barracuda, and large pelagic fish. Giant boulder coral formations and large table corals are plentiful in the shallows of this site, and shelter many species of schooling fish in between the boulder corals. It has a unique topography of two slopes with a rounded wall in between the two slopes, and the reef on top of the wall ascends at a slighter angle than the two slopes so ridges are formed at both ends. Patches of many species of hard and soft corals look like planted gardens in the white sandy slopes. Surgeonfish, parrotfish, jacks, rabbit fishes, sea snakes and amazing numbers and species of anemonefish, damselfish, angelfish, and butterfly fish are here, with the chance to spot dogtooth tuna and Spanish mackerel. This site is not able to be dived frequently because it is very prone to strong currents which can also be downward or upward. This site is steep slope and vertical wall with large sponges, whip corals and soft corals. Surgeonfish, groupers, triggerfish, parrotfish, banner fishes, snappers, big schools of fusiliers, jacks, tunas, bump head parrotfish, and if we are reasonably lucky sharks and huge schools of black fin barracuda and big-eye jacks. Vertical canyons and many cracks is this wall sheltering snappers, surgeonfish, groupers, parrotfish, napoleon wrasse, triggerfish, and schools of different fusiliers. Reef sharks are often seen passing below. This site is a combination of alternating slopes and walls with very good coral growth, especially soft corals. Some nice caverns can be found here too. Colorful nudibranchs, tube and barrel sponges, whip corals, and big gorgonians dominate the landscape. Scorpion fishes are easy to find here, and napoleon wrasse and bump head parrotfish are sometimes spotted. You’ll find a steep slope with reasonable coverage of colorful soft corals. A real mixed variety of tropical fish species here, but glance out in to the blue from time to time for a chance to spot big yellow-fin and dogtooth tuna. A long straight slope with reasonable coverage of soft and hard corals dominates the landscape here. More noticeable on this dive are the numbers of whip corals, large barrel and tube sponges. Schools of blue and yellow tail fusiliers and drummer fish represent the larger amounts of fish, but there are reasonable numbers of angelfish, butterfly fish, parrotfish and unicorn fish. This is the best site for the chance to spot giant frogfish. Nice variety of sponges, hard and soft corals with colonies of acropora are found on this wide flat reef. Triggerfish, parrotfish, large bump head parrotfish, jacks, surgeonfish, crocodile fish, snappers, tunas, white-tip reef sharks, and great hammerhead sharks are occasionally seen. Big Stone like the bow (front) of a boat. Only for very experienced divers with deep dive training. This rocky exposed site doesn’t have much coral coverage or so many species of fish, but if the season is right a 05:30 am deep dive can reward the divers with great hammerhead and other sharks passing by. The profile begins with a gentle slope and then becomes a wall and drops to 25 meters, with plenty of soft and whip corals, colorful varieties of nudibrachs, and an eerie forest of big acropora coral. This is one of the best places for blue and yellow ribbon eels. Other popular species are here are morays, snappers, groupers, butterfly fishes, triggerfish, parrotfish, surgeonfish, sweetlips, napoleon wrasse, rabbitfish, emperors, coral bream, eagle rays and many unicorn fish. A Dutch cargo ship sank on the 22nd February 1942. The wreck lies on a sandy slope at 30-40 meters and one of the twin screws and the rudder of the 60-meter ship are still intact. The wreck is covered with corals and an oasis for yellow & grey trumpet fishes, large puffers, angelfishes, butterfly fishes, Moorish idols, sweet lips, snappers, batfishes, scorpion fishes, crocodile fishes, and White-tip Reef sharks often resting under the wreck. This wreck is exciting even for divers who don’t necessarily wreck dive because of the island of life that it supports. Visibility can sometimes be limited as the wreck lies relatively close to shore in the bay of Manado. After leaving the wreck we head up in to the shallows for more discoveries in a semi-muck diving area in 7 to 4 meters depth to look for macro life like blue & yellow ribbon eels, robust ghost pipefish, ornate ghost pipefish, giant moray eels, white-mouth moray eels, mantis shrimps, octopuses, crocodile fish, flying gurnards, various species of scorpion fishes, the occasional frogfish, and lots more for the avid macro photographer. A semi-“muck’’ dive for the more rare, exotic and bizarre marine life like various species of frogfish, Pegasus sea-moths, bob-tail squid, ribbon eels, ornate and robust ghost pipefish, leaf scorpion fish, crocodile fish, star gazers. Coral patch reef in combination of light to dark colored sand in 3 to 6 meters, followed by a flat sandy area that gently slopes downward. On the sand slope a variety of life can be found sheltering around tree stumps, branches, rocks, bottles and anything else that can offer a home or hiding place. This site is more of a true “muck” dive with flat areas and slopes made up of mostly sand, fine sea-grass, and debris. Good site for chances to spot flamboyant cuttlefish, coconut octopus, common octopus, tiny frogfish, eels, pygmy pipe horse, and the occasional mimic octopus. More surprises can reveal themselves on this dive. On almost all dive sites there are hundreds of species of fish, corals, and other tropical marine life, and the species listed in the descriptions are the most likely inhabitants to be seen there. Please note that mild to strong currents can be found at many of the dive sites of Bunaken Manado Tua National Marine Park, and our professional dive team is committed to ensure diver safety and quality of your dives by planning the sites according to diver experience, location, weather and tidal conditions. Leave it to us to make your dive experiences fun, safe, and exciting!